A very kid-friendly cafe with all the trimmings of good food, highchairs, change table, kid’s menu, toys and more. 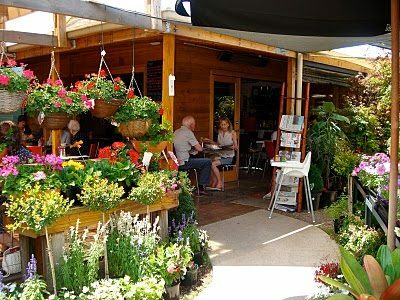 Set in the tranquil surrounds of a beautiful plant nursery. Families and kids are made very welcome at the Kew Nursery and Cafe. 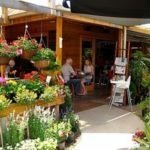 The staff are lovely and chatty, there are plenty of highchairs, room for prams, a folding change table in the toilet, a big overflowing toy box, kids sized table and stools on the verandah, a great kid’s menu and lots of sweet cakes and treats. What more could you want? As the cafe is situated in the middle of the nursery and is surrounded by lush greenery and pretty coloured flowers, it has a very peaceful tranquil vibe. You feel like you could be in the middle of the country somewhere, or for little ones who would be dwarfed by the majority of the plants, perhaps they could be in a magical enchanted far away secret garden. The little ones are definitely well catered for with their own menu, with breakfast options like the kid’s brekkie – one egg, bacon and toast, porridge or a single pancake with maple syrup. For lunch they can munch on a home made spring roll, sausage in bread, soup and toast, fish and chips, or a range of fresh or toasted sandwiches, and then for treats there’s fairy bread, ice cream with topping and sprinkles, and cute little “Teacups”, a marshmallow tea-cup on a biscuit with a freckle on top. To drink there’s kids sized iced and hot chocolates, and milkshakes, as well as Baby-Cino’s and Pop- Tops. All kid’s meals are also served on brightly coloured kid’s sized plastic plates, cups and cutlery a la Ikea, so you don’t need to worry about breakages when they are tossed from highchair to floor. For adults the menu is also varied. For breakfast there is bacon and eggs, omelettes, a breakfast wrap, porridge, pancakes and Phillippa’s sourdough or fruit toast. For lunch there is a mixture of tastes and flavours – from Japanese to Cajun to Greek to Indian and there is a good selection of wraps, salads, pides, soups, stews and stir-frys. I recommend the Japanese pancake. The Kew Nursery and Cafe is open 7 days for breakfast and lunch. They serve breakfast all day and are also licensed, so it is a perfect spot for a late lazy Sunday brunch, or a nice lunch accompanied by a glass of wine or bubbly.